I love sherbet ... rainbow, orange, lime, raspberry, pineapple ... I love them all. I'm not the least bit opposed to ice cream and you wouldn't have to twist my arm to get me to eat it, but given a choice between the two I'd choose sherbet. When we go to the ice cream shop I'm the oddball who orders sherbet while everyone else fills up on Superman or Cookie Dough ice creams. And yes, I pronounce it sherbert. How do you say it? This quilt reminds me of sherbet. The colors have that smooth, soft yet bold, colorful feel of a container of rainbow sherbet. Yum. 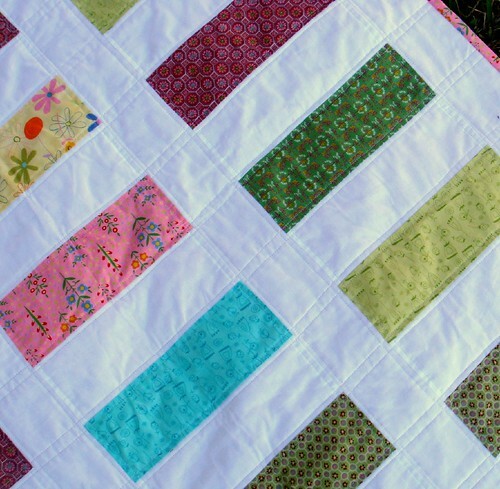 The idea for this quilt came from this image that I'd saved in my flickr favorites. Katie, who made the inspiration quilt, creates some incredible stuff, as can be seen on her blog, Philigry. She has a beautiful home ... well worth looking through her blog to find pictures. I admire many of her talents, but none more than her ability to keep a pretty, mostly white, house with three small children. I've been having a lot of fun going through my flickr favorites for quilt inspiration. There is so much great inspiration there. I had no idea how many images I'd saved, but I feel so lucky that I did save them ... they've saved me from my sleep-deprived brain-dead self. 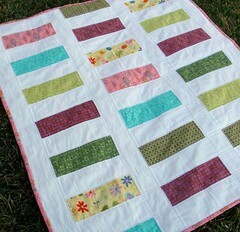 The quilt ... it's pretty straighforward ... blocks of color divided by white sashing. The backside is red Ikea fabric with a row of blocks about 8" from the top. The binding is pink. 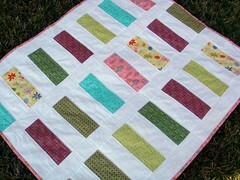 The quilting is done in straight lines about 1/4" on each side of each seam. The batting is a 50/50 bamboo/cotton blend. This one will eventually go on etsy, I believe. Back to word pronounciation ... how do you say "often"? "Wash"? "Realtor"? "Ridiculous"? Very cute! And that would be "sherbert", "offen" (usually, but occasionally "off-ten" though I have no idea why I waffle on this one! ), "wash" (NEVER "warsh"! ), "real-ter" with emphasis on "real", and "re-dik-you-luss" (is there some alternative on this one?). Incidentally, I have been really annoyed by a radio ad lately that says "real-tor" in a way that rhymes with "steel door". Driving me nuts! it's sure burt in my house too! any way you say it...makes a great inspiration for a quilt! Ooo I love the quilt! And is is sherbert. And cue-pon NOT coopon. Ofen and realtor too. Oh, and never warsh!